With a strong focus on design and user feedback, Slack has been taking the team communications and messaging market by storm. Since last year, Slack has been stealing all the media hype and attention away from its main rival, HipChat. Developed by Altassian, the same Australian based company behind the well known and loved bug tracking software JIRA, HipChat was once the chat king. Though recently, it seems like HipChat has been left in the dark. From its colorful design, ironic name and powerful customization it’s easy to see why Slack is on the receiving end of all the communication app hype. Launched in 2014, Slack claims to have 2 million daily users and over 600,000 paid accounts. 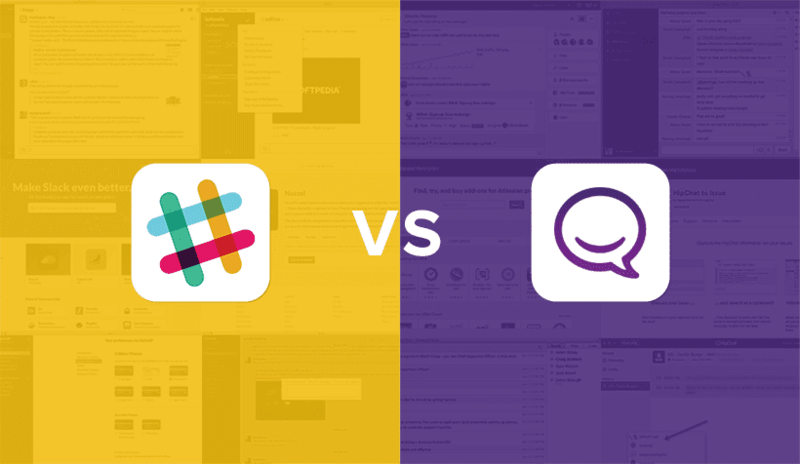 But is the hype for Slack just that – when compared to the messaging veteran that is HipChat, how does Slack really stack up? From a purely aesthetic standpoint, it’s easy to hand the reigns over to Slack. I certainly did at first. They brought in the experts from Metalab to spearhead the project. From the logo to the user interface and bright colors, Slack has a way of grabbing your attention. But when I gave them both a try, I found myself preferring HipChat’s simpler approach. That’s not to say that HipChat looks bad, past updates have refreshed the veteran platform to be more in line with current designs; and the more professional theme holds its own against Slack’s colorful interface. Out of the box, design is almost where Slack falls short. Sure, it’s pretty colorful – but it’s also a bit harder to digest and navigate, and that’s what really matters. 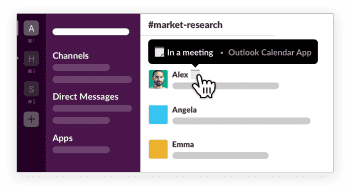 Slack organizes your communications through “Teams” – essentially your team or companies chat room. Within your Team, you can have sub Channels, and Direct Messages. In the app, a left panel is dedicated to displaying your current team at the top, as well as channels and direct messages below. The very far left side will display multiple teams to easily switch between through one user account. The middle is your content stream, and the right side can display additional info like mentions and reactions. This is where I had some trouble. Instead of consolidating everything upon creation of a Team into one universal chat, Slack defaults you with multiple channels to start. This isn’t too bad, but jumping into an established team with more than two can be really confusing. No doubt my first few days of using Slack I found myself hunting, my eyes scanning up and down through channels and direct messages to find where I wanted to be. Each channel is designated with a hashtag, or pound sign (#), while direct messages get circles, lit up or not to display online status. First switching to Slack, this left me confused – I wasn’t finding the designations I normally would. While you can’t drag around room names or certain messages to prioritize, you can Star any channel, message, or file. This adds a new starred section above your channels so you know where the important things are. Compared to Slack, HipChat’s design comes off almost bland or simple – and that’s because it is simple. Like Slack’s Teams, HipChat lets you join Rooms and create as many as you would like. Unlike Slack, HipChat starts you off with only one room, one large general chat for everyone you invite. Beyond this one single general room, you can create as many rooms as you would like, or direct message coworkers, which automatically list under Rooms as they are started. 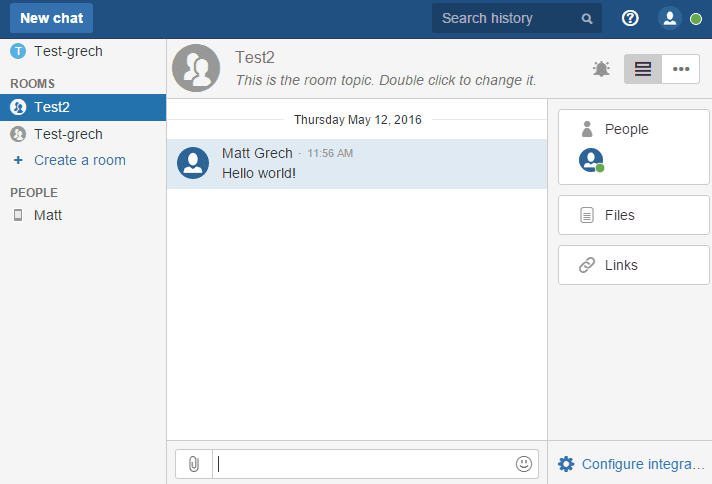 HipChat even lets you drag and drop rooms to reorganize the list. This is, again, all displayed on the left panel, just as in Slack. But this time, the rooms are designated with more familiar simple circular icons. This may not stand out to most, but when I see a hashtag my first thought is not “that’s a room to join.” The Middle of HipChat is also dedicated to content, and the right clearly lists Files and Links, with an option to hide the sidebar. HipChat almost seems to keep things simpler on purpose. With Slack you get the extra bells and whistles and pretty colors, but with HipChat it’s much easier to jump right in and instantly figure out where everything is. Winner: HipChat – From a purely aesthetic standpoint Slack is very good looking, but when it comes to readability HipChat just makes everything a bit easier. It’s not about factory settings for Slack, though, and customization is really where the program shines. Between six default color themes, two colorblind modes and even a completely custom create-your-own option, it’s hard to get bored with Slack’s appearance.There is a catch, with the flexibility to make shape the design to be your own leads to the previously described learning curve. Unless you take the time to make it your own, Slack will take a bit getting used to. After playing with different colors, starring different chats, and remembering that “#general” is a channel name, I had less trouble finding my way around. On the other hand, HipChat’s customization is almost existent compared to Slack. You can hide or show a right side panel that includes extra information and tagged files, but there are no color options. Default you have a white and blue design, and your customization is limited to this “light” theme, or an opposite “dark theme” sporting grays and black. One customization option HipChat does have over Slack is the ability to reorganize your list of rooms or direct messages – but this isn’t much compared to Slack’s powerful options. Winner: Slack – With very limited customization options for HipChat, Slack is the clear winner. Arguably one of the most important aspects of communication tools is how they notify you of new messages. If you’re constantly missing mentions and calls for your name, or responses from coworkers it almost defeats the purpose of instant communication. Both Slack and HipChat allow for noticeable alerts to keep you in the loop. Either through desktop apps, email, and mobile push notifications supported by both HipChat and Slack you shouldn’t have much trouble staying connected. While HipChat pulls ahead as it even allows text message notifications in its mobile app, Slack regains some ground as it again offers more robust customization. While almost trivial, Slack does provide 12 custom sounds for your notifications, but more importantly lets you even designated certain, highlighted words to send you alerts on. When someone mentions a specific project or client, you can setup Slack to send you a notification. Both allow for do-not-disturb settings, quiet modes for certain rooms and very similar desktop notifications. However, it is worth noting the HipChat mobile app has a less reliable status setting for online users – it seems like users that switch to their phone won’t always be marked properly and still display as online at their desktop. Winner: Slack – While HipChat does everything you need it to, Slack actually does a little more with allowing you to highlight specific words to spawn notifications. When it comes to messaging platforms, there are only so many ways you can do it differently. Both HipChat and Slack provide pleasant user experiences, but with user experience its the little things that count. Despite a learning curve to adopt Slack, once I got past hashtags for room designations, I found myself enjoying Slack’s approach to “how things feel” a little more. Each program will embed pictures, links, videos, tweets and files directly into your chat stream and even provide a list of emojis and emoticons to reply to your coworkers with. Dragging and dropping files to share gives you neat little animations and a pop up window to confirm your action. SlackBot, a helpful little robot makes tasks like to-do lists more engaging. HipChat will let you add your own custom emojis for anyone to use, but Slack comes with a built in Giphy integration and has a nice “react” button under everyone’s messages. 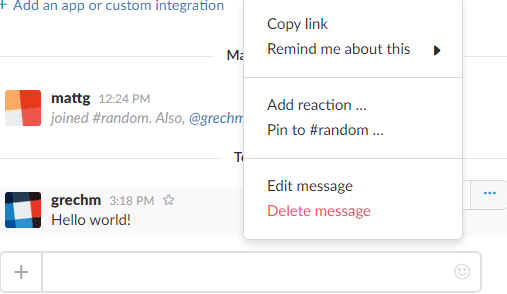 In a similar fashion, Slack lets users edit their messages for an unlimited amount of time, and has a nice little Edit button right under each message. On the flip side, HipChat restricts editing to a one minute period after the message was sent, and requires you to type a slash command. Its little details in Slack that make otherwise basic communication feel rewarding or simple to use. Slack, with its customizable interface, fun and colorful design the flexibility to choose your own colors, avatars or notification sounds, and even respond with gifs or react directly with emojis, you can find yourself getting work done without even realizing it. Of course most of these features can be added or worked through custom API integrations in HipChat, but out of the box Slack feels less rigid. Winner: Slack – HipChat does make things a bit easier to read, but extra details like an integrated edit button and solid feedback for reforming actions gives Slack an edge. 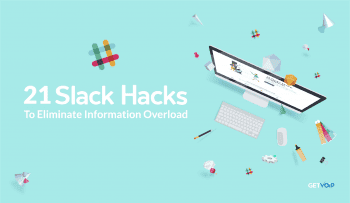 Slack likes to make a point of supporting over 150 integrations, and has a nice App Directory to let you quickly search and browse any of these extensions. But then again, so does HipChat. Jumping between Slack’s App Directory and Altassian’s Marketplace, I wasn’t able to find many gaps in supported integrations. A couple of things Slack relies on integrations for, like Video Conferencing and Screen Sharing, HipChat will do Native. 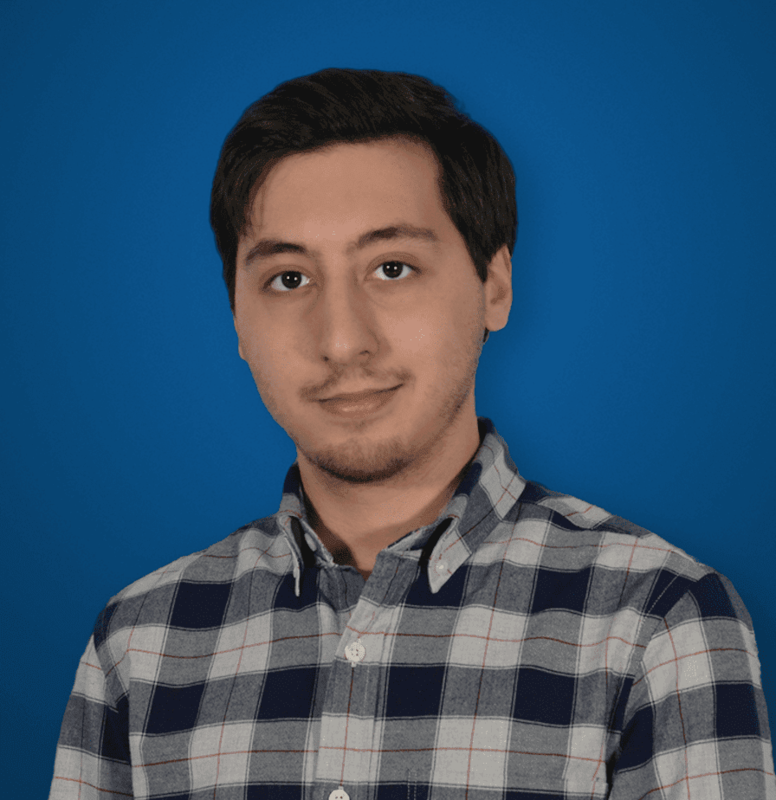 Where HipChat really shines in integrations is with other Altassian platforms, like JIRA, the very popular management tool for developing software, and Bitbucket which is used to collaborate and mange code. Slack does have some third party developed integrations for JIRA, but Altassian’s native integration absolutely makes HipChat the go to for any team using either program. Additionally, and perhaps most importantly, Slack limits your integrations to a mere 10 on their free plan, and doesn’t remove the cap until you fork over $6.67 per month for each active user. Meanwhile, HipChat’s free service doesn’t limit your integrations, and their paid service is a lot cheaper at only $2 each month per user. 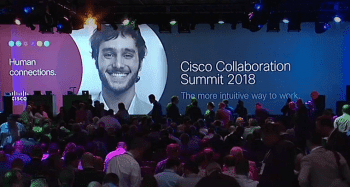 Winner: HipChat – An equal number of integration between the two is settled by HipChat’s unlimited integration for free users, and native relationship with other Altassian programs. Both Slack and HipChat offer free versions of their communication tools, but when you compare side by side what you get, HipChat proves to be the stronger contender. 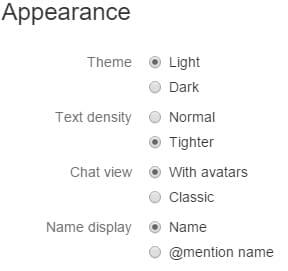 Features are fairly the same, but your accessibility to them is what differs with HipChat offering just a bit more. Both programs provide group chat, file sharing, free mobile apps, support for Windows and Mac desktop apps, and limited message archives. Both also limit their file storage to 5gb on free plans. However, while Slack only allows for 10,000 archived messages, and only 10 service integrations, HipChat boasts a 25,000 message archive limit and as many third party integrations as you need. HipChat even supports guest access on their free platform, something Slack makes you upgrade and pay for. Slack claims their rooms have an unlimited user count, but a couple of sources have seemed to hit a limit at 8,462 per channel. HipChat does not seem to have any such limitations or issues. Slack does include a beta version of their one-to-one voice calling in free plans, but if voice chat is what you need in a messaging app you can check out our roundup of Slack alternatives with VoIP. Other shared features between the two include unlimited number of rooms, drag and drop file sharing, customizable alert settings, searchable for keywords, messages, links and files and integration with other applications. Winner: HipChat – With less features locked behind a paywall, and less restrictions on the features HipChat is the clear winner here. It is important to note that for paid plans, Slack is unique in that you are only charged for “active” users, as opposed every single account regardless of its status and use. Slack’s Standard plan, for $6.67 per active user removes the limit on archived messages and integrations, adds guest support, priority support, Google authentication, a configurable email ingestion service, user groups, and a beta for group calling. In comparison, HipChat’s only paid plan, HipChat Plus, is a mere $2 per user a month and adds native video chat, screen sharing, and unlimited file sharing. Taking it one step further, Slack offers a Plus plan for $12.50 a month per active user which includes compliance exports of all message history, support for external message and archival solutions, 99.99% guaranteed up-time SLA and further customer service improvements. A soon to come Enterprise plan will add features such as unified security, data retention and compliance policies and organization-wide reporting and analytics. HipChat already has a step ahead in the Enterprise market with the option to host your own server in house for complete control over the system. It seems that as the price for Slack climbs, the features do not necessarily outweigh the cost when compared to HipChat. For less money, only $2 a month per user, HipChat includes the same, if not more features like video calls and screen sharing. Winner: HipChat – Again with less hidden behind a paywall, and only one vastly cheaper payment plan, Slack is harder to justify paying for. If you’re looking for a free solution to just make chatting with your small team, you can’t really go wrong with either choice. 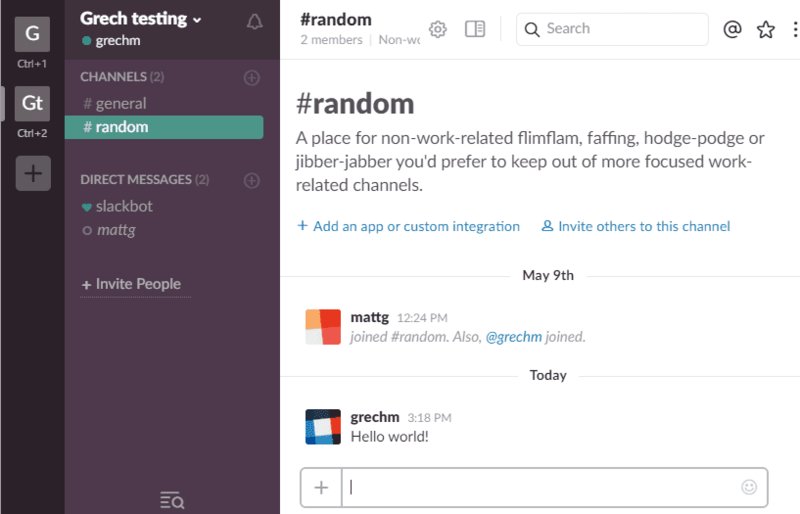 Slack does have a beautiful design, and customization is very strong – once you get used to it. It works for small teams, but a steep learning curve and a lock down on features compared to HipChat hurts its case. Agreeably less interesting to look at, HipChat’s easier to read and more familiar design takes less time to get used to, and access the options you need – even if there are less of them. Customization might not be HipChat’s strong point, but a pretty design doesn’t necessarily make software better. When you boil away the fat and compare the features provided and pricing plans available, HipChat just makes a lot more sense. If you want to learn even more about which team collaboration platform would work best for you and your team, check out our Slack Reviews or HipChat Reviews to submit your own or read each providers review.